Moen Hostel & Vandrehjem i Borre, Danmark: Bestill nå! This countryside hostel Moen Hostel & Vandrehjem offers a communal kitchen, free parking and a garden with BBQ area. The hostel’s dining room is a nice place to enjoy a meal. Guests can also relax in the TV lounge. We speak your language! The restaurants and beach at Klintholm Harbour are 3 km away. 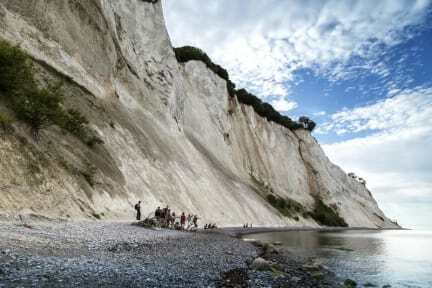 GeoCenter Møns Klint is within 5 km.Lake Hunosø offers excellent opportunities for fishing. Other nearby recreational options include hiking and cycling. A trail leads directly from the property to Klineskoven Forest and Klintholm Manor, 1 km away. A bus stop is found right outside the door of Møn Hostel. At Møns Hostel & Vandrehjem, guests can choose between rooms with private or shared bathroom facilities. Some rooms have a sink in their room. We of private and dormitories for 2, 4 or 6 guests. Check out from 08:00 to 10:00 . Breakfast not included, Aduld 75 DKR, Children under 12 years 35 DKR. Reception is open 08:00 - 11:00 and 16:00 - 19:00. Hyggelig overnattingssted, fin beliggenhet ved f.eks. besøk på Møns Klint, nydelig frokost og god valuta for pengene. Kommer gjerne igjen.